Prism Rainbow & Prism Gold Are In-Stock! 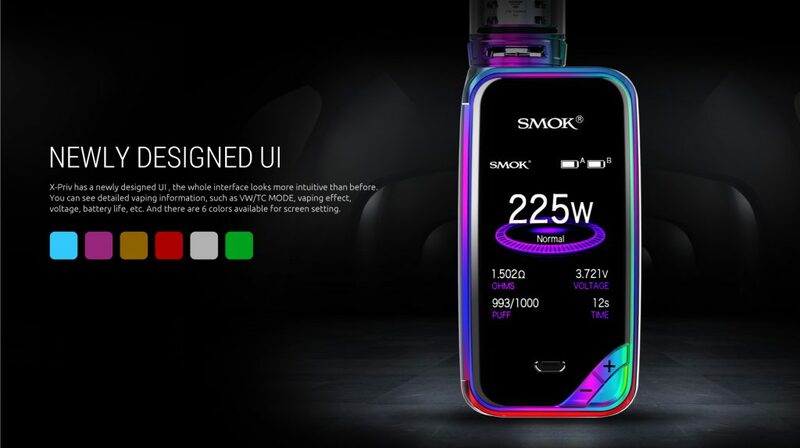 Smok’s been leading the revolution when it comes to new devices ever since the release of the TFV4 & then the Alien 220W kit. 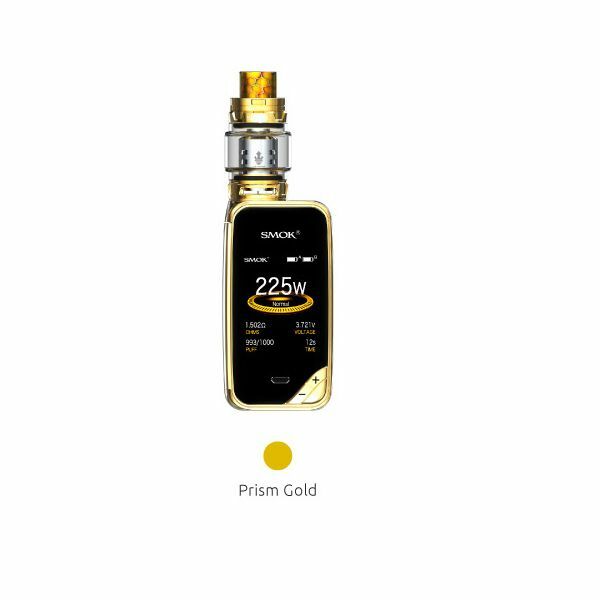 This brand new X-Priv kit is their latest refresh with a brand new updated user interface. 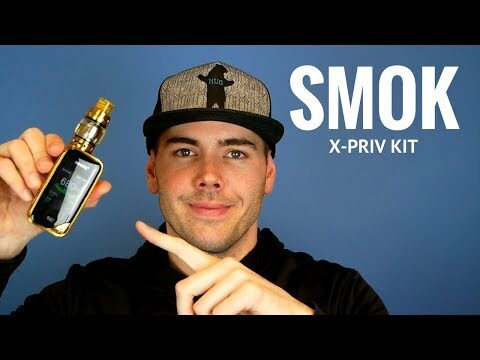 The device itself, the X Priv is a dual 18650 battery mod (batteries are not included – we recommend the LGHG2 batteries or the Samsung 25R 18650s) The mods primary functions are similar to previous Smok products with a maximum wattage of 225 watts and it also comes loaded with temp control and TCR, along with various other modern features (mentioned in the X Priv specs below) This new mod also has the same side firing bar style as similar mods by Smok like the PROCOLOR & Majesty. 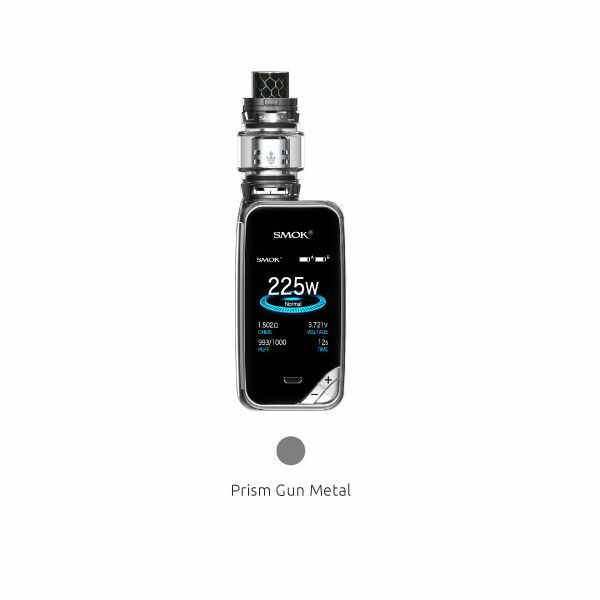 What Sets The Smok X Priv Apart From Other Smok Mods? This is a question that we’ve been asked frequently. 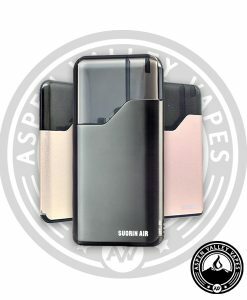 The new X-Priv is one of the most compact dual 18650 mods that we’ve ever seen (88mm*46.5mm*30.4mm) and it is also one of the lightest coming in at only 172 grams(!) 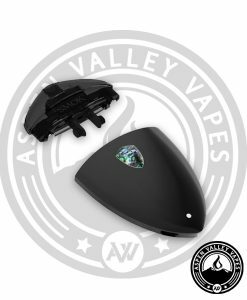 Not only is this vape mod one of the smallest options out there for dual 18650 battery mods, but it also has a newly designed user interface that is beautiful. 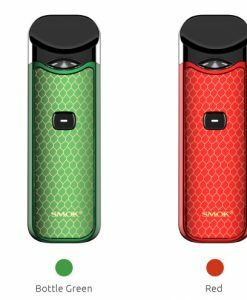 The Smok XPriv boasts a 2″ color screen, which is slightly larger than Smok’s standard screen on their previous dual battery mods. 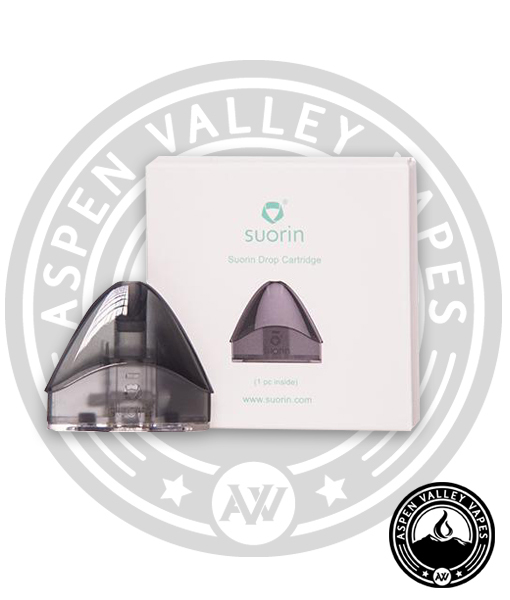 The finish on this mod is glossy, which really makes the device pop compared to similar products on the market. One downside to the glossy finish is that the glossed sides are a little prone to fingerprints, but those can easily be wiped away. 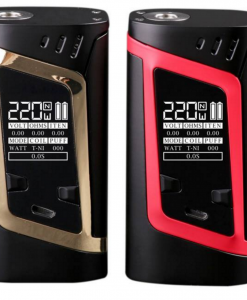 The front of the mod, where the screen is located, surprisingly doesn’t get too marked up with fingerprints. 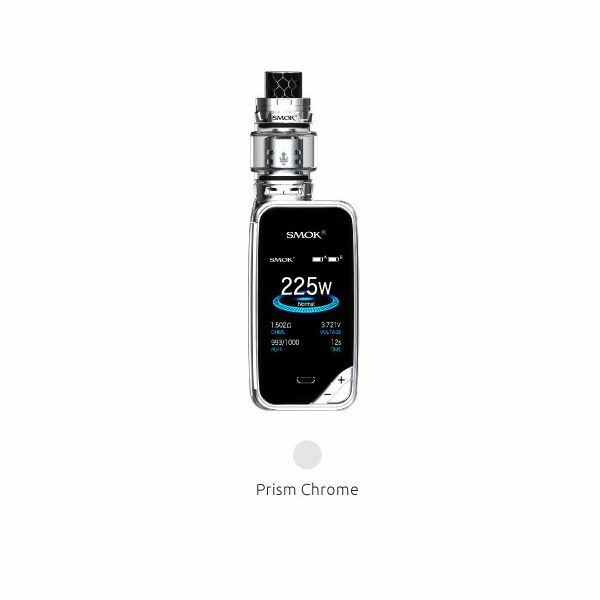 What Information Is Displayed On The X-Priv Screen? 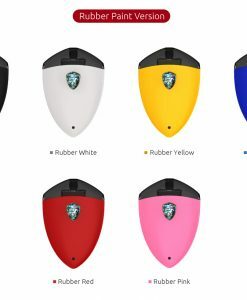 The large beautiful 2″ color screen prominently displays the battery life of each battery inside of the mod, the current wattage/temperature that you’re vaping on, the mod that you have it set in, the resistance of your coil, the voltage, a puff counter, and then the time of your last vape. You also have the ability to customize the color fo the font located on your screen and there is six different color options. 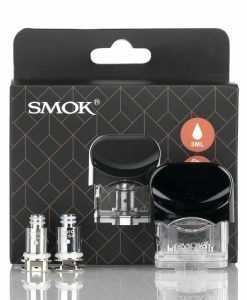 What Is Included With This Kit? 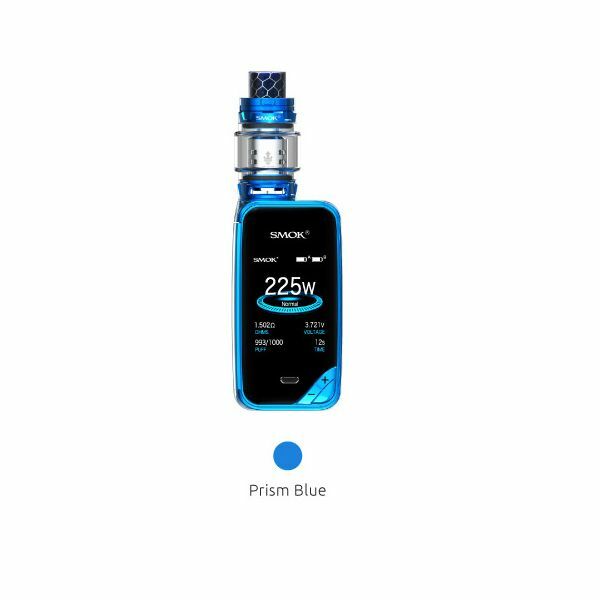 This is the complete kit, so you will get the X-Priv mod, the Smok TFV12 Prince tank, one V12 Prince-Q4 0.4ohm Quadruple Coil (pre-installed in the tank), one V12 Prince-T10 0.12ohm Decuple Coil, a replacement glass tube, a USB cable, a user manual, and a bag of spare parts. 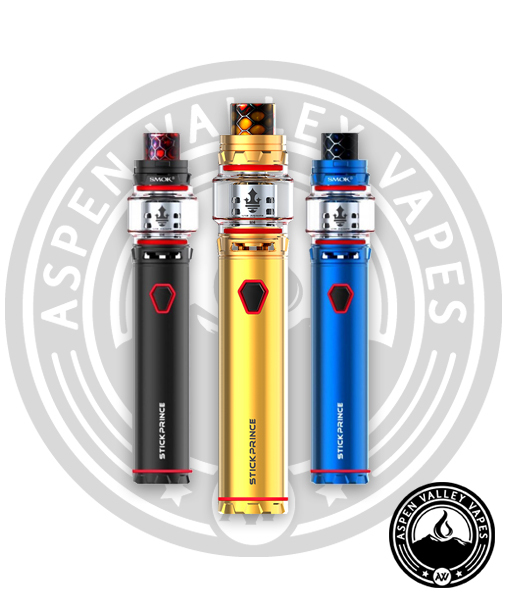 The “spare parts” include o-rings that match the color of your kit (gold will come with gold o-rings, etc), and it also includes an extra rubber top filling piece. 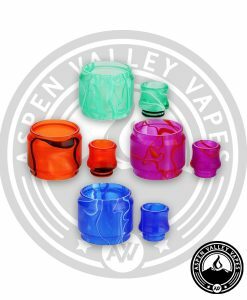 Your TFV12 Prince will come with black o-rings pre-installed, but if you’d like to match the tank completely with your mod and tank, then you can use the included colored o-rings. 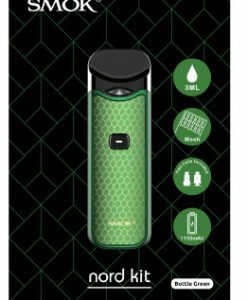 The only two things not included is batteries and then you will want to pick up some of your favorite vape juice to fill up the Prince tank. 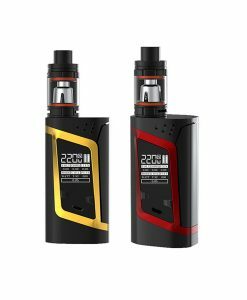 Is The TFV12 Prince A Good Tank? Yes, the Prince is a fantastic sub ohm tank. 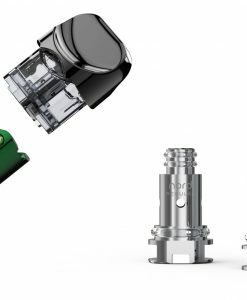 The Prince has been dubbed by many as one of the best, if not THE best sub ohm tank of all time. 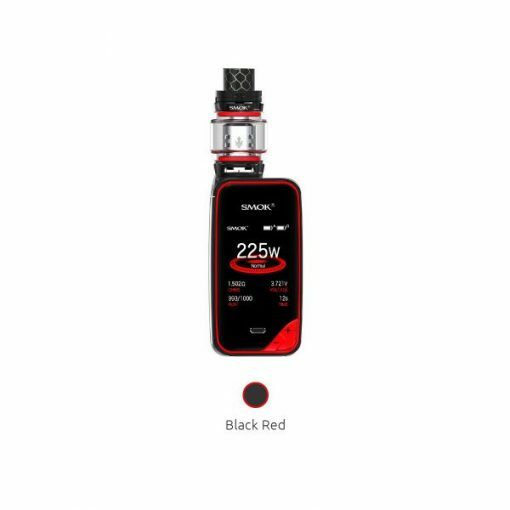 There are currently four different coil heads available for this tank, and your X-Priv kit includes two of them to try out. 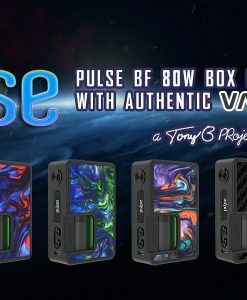 The other pre-built sub ohm coil option is the V12 Prince-X6 0.15ohm sextuple coil which is rated at 50-120 watts. 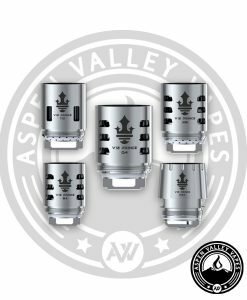 The fourth coil option is an RBA dual coil, which will allow you to build your own coils instead of purchasing pre-built coils. That is only optional though – most people prefer the Q4 & T10 coils. 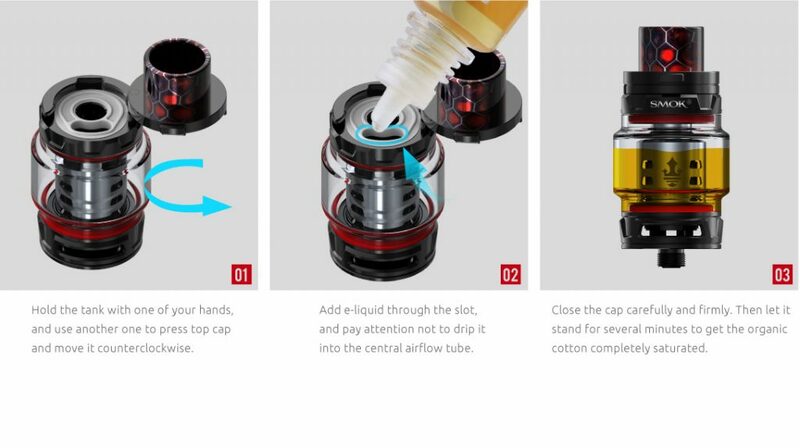 The image below shows how easy it is to fill up this tank and then the new swivel top locking mechanism to keep your tank secured and avoid vape juice leakage. this hardware sure did come in handy! !